Estonia is one of the most advanced e-societies in the world - an incredible success story that grew out of a partnership between a forward-thinking government, a pro-active ICT sector and a switched-on, tech-savvy population. Estonia boasts the world’s leading IT infrastructure and e-services. The creation of different e-services as well as linking them to government databases and rising popularity among users has greatly influenced and given an enormous boost to the ICT sector in the country. Aforementioned success enables to share the Estonian knowledge and competence on a wider scale. TTÜ has been providing this knowledge for several years by having many different masters’ programs related to these topics. Now you can experience the Estonian success on spot by joining the Secure e-Governance Summer School. Tallinn University of Technology (TTÜ) is the flagship of Estonian engineering and technology education. This summer you can experience Estonian approach to robotics and 3D printing on spot during whole two weeks. The aim of the summer school is to give an overview of the use of microcontrollers for robotic applications and CAD modelling with 3D printing for robot mechanical design. To develop practical skills and knowledge of the robotics and apply acquired knowledge for the practical robotic tasks. We offer limited number of full scholarships! Helmes is one of Estonia’s largest IT companies. It was recognised as the most successful software developer in 2014, secured first place in the 2015 competitive performance rating and was named one of the most family- and employee friendly companies in Estonia in 2016. 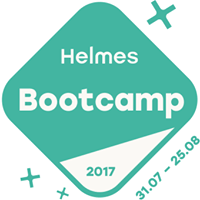 If you feel like doing something interesting and useful this summer, then why not come to the Helmes Summer Bootcamp this August. The Bootcamp is a four-week intensive and fun software development training course, where you can quickly whip yourself into shape and develop a real-life IT project.